Precision steam generators provide large volumes of high quality steam, when you need it, where you need it, every time you need it, without wasting energy waiting for that call for steam. Our steam generators are manufactured to stringent industry standards, with a wide variety of specifications for a range of applications. 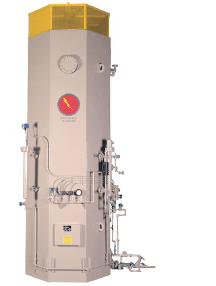 They are available in electric (HVJ and ISH series) and unfired (USG series) boiler designs, with custom options available. 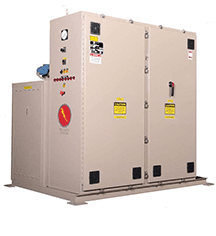 Our steam generators are most commonly used for hydronic heating, sterilization, humidification and process steam. The HVJ is configured to operate from one of three different 3-phase power supplies: 4160 volt, 6900 volt, and 13.2 KV, and its standard operating pressures range from 100 psi to 400 psi; for higher pressure models consult factory. Particularly well-suited as an auxiliary boiler for power generation facilities and central steam plants, or as a pony boiler for industrial process expansions or additions. The HVJ provides virtually instant steam when needed, ramping up from standby to full output in minutes or even seconds, and can dramatically reduce energy costs using off-peak power. It is commonly used for hydronic heating, sterilization, humidification and process steam. The HVJ is truly one of the most remarkable innovations in the industry, with a long line of benefits, including: superior steam quality (99.8% pure), high output capacity, and the industry’s best actual operating efficiency (99.7% vs. 65% for fossil-fuel boilers). The HVJ’s total cost of ownership is lower than most any fossil-fuel fired boiler due to its: lower installed capital cost, insurance rates, personnel costs, maintenance costs, reduced energy costs, and lower water treatment costs. With no products of combustion, the HVJ is also a safe and environmentally friendly option, and in some areas where the air quality is not in compliance with EPA standards, it may be the only viable option.